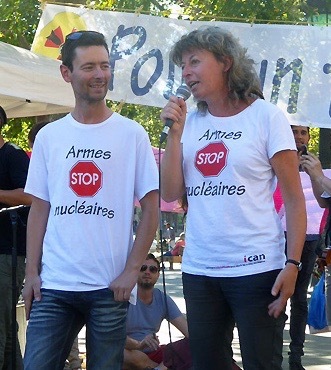 Opening day of the Eurosatory Arms Expo, June 13, was enlivened by 50 activists from the French collective Désobéir (Disobey) as they took several simultaneous actions against war. 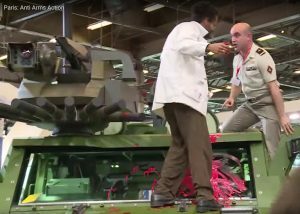 Professionally attired activists entered the suburban Paris exhibition hall, where some crossed the rope lines and climbed on board a Leclerc tank and another vehicle, unfurling banners and pouring red paint on the weapons. A few took photos and video of the protest while others inside displayed banners and spoke out against the business of killing. Outside, more activists rallied and some blocked the doors to the exhibition hall, which had been marked with red paint as well. Charged with defacing the building, they will be in court on November 7. “As a matter of fact, you have had a person attend your protests in Camp Douglas who has threatened to kill our Deputies.” This piece of startling news was revealed to me in a letter from Juneau County, Wisconsin, Undersheriff Craig Stuchlik dated July 25. 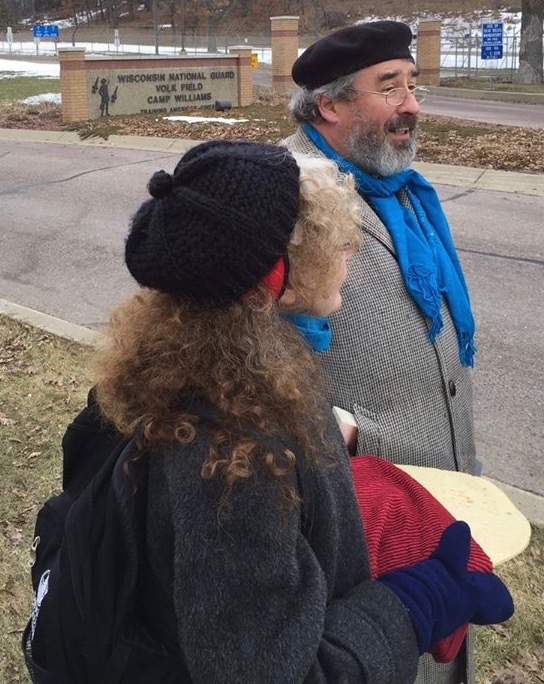 I had written to the sheriff’s department requesting documents under the Open Records Law and for an explanation of the department’s response to a demonstration at Volk Field, a Wisconsin Air National Guard base near the town of Camp Douglas, where my colleague at Voices for Creative Nonviolence Kathy Kelly and I had been arrested on February 23, carrying a loaf of bread and a letter for the base commander. There is a facility at this base where military personnel are trained in the operation of remotely controlled Shadow Drones that have been instrumental in the targeted assassination program that legal experts label war crimes and that military experts say recruit more enemies for our country than they kill. Six “Peace Patrol” activists were detained while attempting a citizens arrest of the commander of the base, Col. Larry Broadwell, for his high level role in crimes against humanity committed daily at Beale Air Force Base (AFB). Beale is home to the Global Hawk Drone, which plays a critical role in the unlawful surveillance and ultimate targeting of individuals in the U.S. drone assassination program. 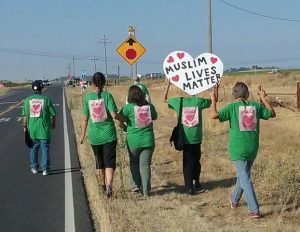 Occupy Beale AFB invites other anti-militarism groups around the world to create their own International Peace Patrol contingents, in a global effort to create a just and peaceful world. (Copycat behavior encouraged). Watch video of the action here. 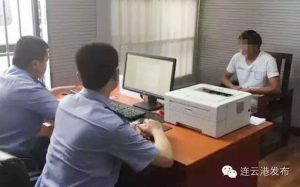 Thousands of residents of Lianyungang, a port city in China’s eastern Jiangsu province, took to the streets for four days of anti-nuclear protest, (coincidently?) from Hiroshima Day, Saturday, August 6 through Nagasaki Day, August 9. The mass assemblies began just days after it was revealed that the city was favored on a short-list of potential sites for a joint French-Chinese uranium reprocessing facility that is integral to China’s expansive nuclear power plans. 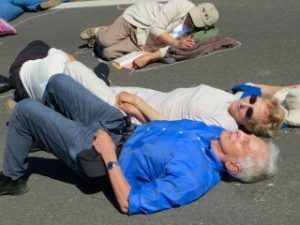 Daniel and Patricia Ellsberg participating in “die in” in the road in front of the Livermore Lab West Gate, awaiting arrest. Photo by Heather Davison. Approximately 200 anti-nuclear activists gathered outside the Livermore Nuclear Weapons Lab on August 9 to commemorate the 71st anniversary of the U.S. atomic bombing of Nagasaki – and to stand with survivors of nuclear weapons from Hiroshima to the Marshall Islands. Keynote speakers included famed whistleblower and nuclear weapons analyst, Daniel Ellsberg, atomic-bomb survivor, Nobuaki Hanaoka, and Executive Director of Lawyers Committee on Nuclear Policy, John Burroughs. Tara Dorabji with Tri-Valley CAREs gave the group a sense of place with her description of current nuclear weapons work at Livemore Lab, while Chizu Hamada drew links between the nuclear bomb and nuclear power. Silverdale, Washington: Local peace activists staged a water-based nonviolent protest and witness for peace in Hood Canal at the Trident nuclear submarine base on August 9, marking the anniversary of the atomic bombing of Nagasaki. 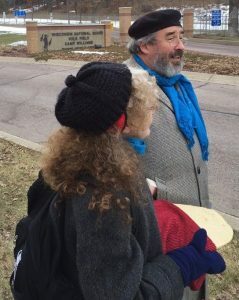 The activists traveled along the Bangor waterfront where nuclear warheads and Trident missiles are loaded onto submarines and where submarines are resupplied for ballistic missile patrols in the Pacific Ocean. 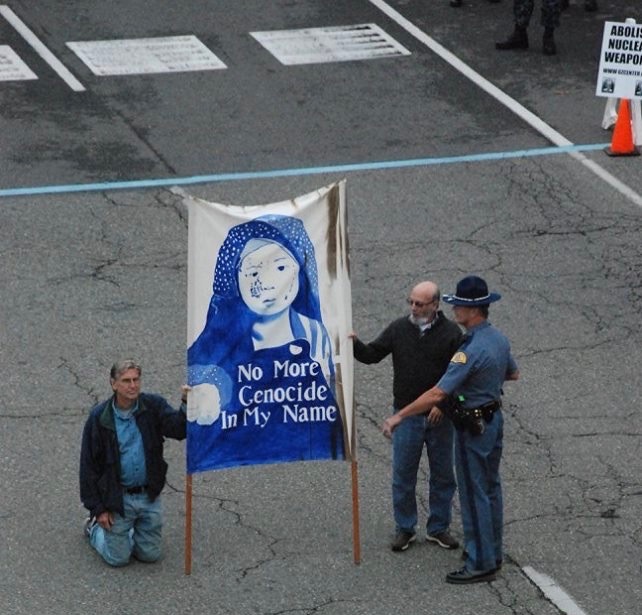 On August 8, activists staged a vigil and nonviolent direct action in which some activists blocked the entrance gate to the same Naval base. 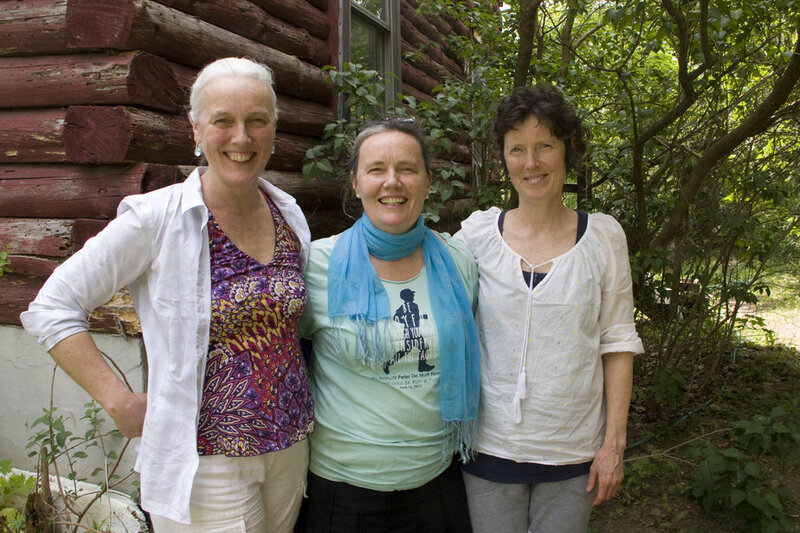 These Catholic social justice advocates are exemplars of the force behind We Are Seneca Lake, one of the nation’s longest-running campaigns of civil disobedience. On a warm May morning, two dozen people wearing blue shirts formed a neat line in front of the gates of a natural gas compressor station in central New York. The facility lay hidden somewhere in the trees behind them, and just beyond was Seneca Lake, a 38-mile azure gash through deep green hills that provides drinking water to 100,000 people. The sun crept over a ridge on the far side of the lake. It was still early enough to intercept the day’s first delivery. Within minutes, a tanker truck neared the gates and pulled onto the shoulder. Word soon came that sheriff’s deputies were on their way, and the protesters started singing a verse that became a spiritual anthem of the civil rights movement.